The 'catching-up' - a myth or a strategy? Internationalisation of Social Sciences in Central and Eastern Europe explores the way in which social sciences, in comparison with other sciences in Europe, have been divided by the poiiticai orders of West and East. As part of the field of science policies in Europe, this book contributes to the creation of a new understanding of the European academic landscape of social sciences with particular focus on Central and Eastern European (CEE) countries. 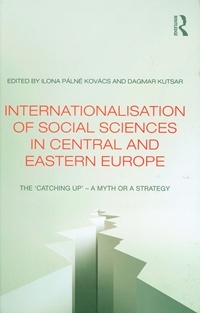 In its investigation of the emergence of social sciences in Central and Eastern Europe following the collapse of the totalitarian systems, this book discusses how the internationalisation of the social sciences and the convergence between Western and Eastern social scientific life is hindered by factors including funding, academic contacts and curriculum development. The issues addressed within the text serve to prompt the realisation that coherence in European social sciences can be reached only if new academic traditions and cultures are developed, and science policies harmonised. This book is essential reading for undergraduate and graduate students of European Integration, CEE or Transitional Studies, and any courses related to science policies. It is also relevant to science administrators and policy-makers at national and European level. Ilona Pálné Kovács is Director for the Transdanubian Research Institute of the Centre for Regional Studies and Professor at the University of Pécs, Department of Poiiticai Science. She has led many local and international research projects in the fields of local and regional government, and regional policy. She has also written numerous books and articies. Dagmar Kutsar is Associate Professor of Social Policy, and Head of the Unit of Family and Welfare Studies at the University of Tartu. She has edited several books, published articies, led local and international research projects in the field of family, welfare and childhood studies.